Michelle Sadgrove Photography specialises in Wedding Photography and people in particular. Based in Central London, UK, she has won countless awards for her images. The list of people she has worked with includes The BBC, Channel Four Television and the New Statesman. Michelle got in touch with Inkbot Design to look at the construction of a coherent brand in order to create more of a professional image. Aiming to build a high-end, quality brand that was in line with her photography, the focus was towards creating an elegant logo design, central to all of the further media. A proposed tagline of, “Your vision at the heart of the image” was put forward to direct the conceptual development. The final logo is a combination of the letter “M” from Michelle, and a simplified heart to fit the romantic, personal approach to her photographs. The elegant logo design is the hub for the brand – from the watermark over the images to the design element letterpressed on her compliment slips. A greyscale colour scheme keeps the eye on the photos themselves – a colour tone would be too overpowering. 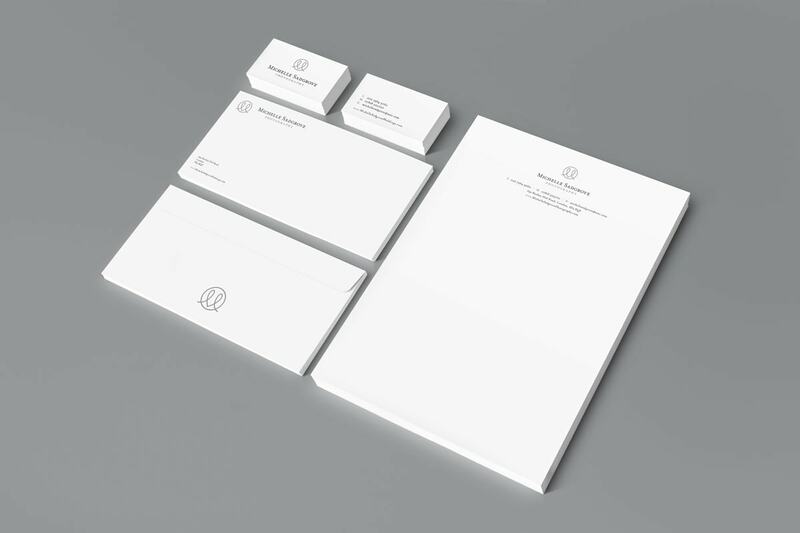 When printed using the hot foil technique, the adjustment to silver really makes for an elegant logo design on the company stationery.